Chris Burfoot beginners guide to studio lighting and why you might need it. This is part 1 or 4 parts - Enjoy! Words and pictures Chris Burfoot A.M.P.A. Studio lighting can be broken down into two categories, continuous and flash. While continuous lighting has two main advantages there are many disadvantages. It's inexpensive, and makes a good starting point for anyone on a small budget. You can see what the light is doing and where the shadows and highlights are. It generally produces more heat than light, very uncomfortable! The light that it produces is not balanced to daylight. OK, so what does this mean in practical terms? The heat produced by a continuous light can make you and your subject very hot and bothered, but because of the very bright light it will also have the effect of closing down the iris in your model's eyes, which it is generally accepted, doesn't make a good portrait. We have all taken photos in artificial light and ended up with yellow pictures! To your eyes, the light from a tungsten bulb looks white, but it isn't. Colour temperature (the colour of the light) is measured in degrees Kelvin, daylight is around 5,600K and a tungsten bulb is more like 3,200K and therefore records on daylight balanced film as yellow. This can be overcome in three ways: Firstly, you can use tungsten balanced colour film. Secondly, you can put a filter on your lens, which will enable you to use any daylight film. The big problem with these two solutions is that as the tungsten filament in the bulb burns it leaves a small residue on the inside of the glass envelope. This means that the colour of the light gradually becomes more yellow as the bulb ages. If you are using print film or shooting digitally any colour cast can be rectified when printing, but slides cannot! The third way is simply to shoot in black & white! This brings us to flash. With a normal on-camera flashgun there is no way of knowing what the lighting effect will be, except to say that if you are using it fitted on the camera - it will be pretty awful! The advantages of studio flash are - modelling lamp, consistency, power and control. Lets look at these one at a time. Studio flash units are fitted with a continuous lamp, which can be seen on this photograph sitting in the centre of the circular flash tube. Because of its position it gives a very accurate indication of the angle and quality that the flash will produce when fired. This makes your lighting easy to set-up, because'what-you-see-is-what-you-get'. As this lamp is relatively low powered you don't get the heat or brightness problem we talked about with continuous light. The only thing to remember is that the flash will be a much stronger light, so the shadows will be darker and the highlights will be lighter. To trick your eye/brain built-in compensation device when setting up lighting, first close one eye (a camera only has one) then squint through your lashes. This has the effect of increasing the contrast level you can see and is much more like what the camera will record. Don't forget to tell your model what you are doing or they might think you rather strange! Remember how we said that as a tungsten bulb burnt it got more and more yellow? Well with flash every time you press the shutter the colour of the light from the flashtube is balanced to daylight. This means that you can use any film you like without the need for filters, even with slide film - no problem. Modern flash units give huge amounts of power, released in a fraction of a second (typically with a unit such as an Elinchrom this is around 1/2500th second!). For most home users a unit with a power of 250, 300, 500 or 600 watt/seconds is usually sufficient. Watt/seconds or Joules (the same thing) is the measure of the power that a flash unit can produce. Don't get confused with guide numbers, this changes by changing the accessory on the front! 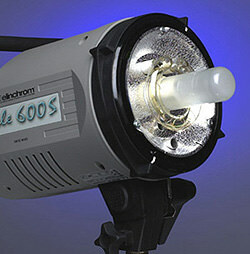 A 300 w/s unit is half the power of a 600 w/s unit, which is exactly 1 f-stop. So if your 600w/s unit was set up two metres from your subject and you were getting a flashmeter reading of f/16, then a 300w/s unit in the same place would give a stop less at f/11. We will cover what a flashmeter is and how it should be used in a later article. It's all very well having lots of power, but it's no use if you can't control it! 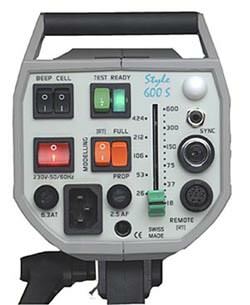 Even the most simple and inexpensive studio flash units have at least a 'full/half power' switch, most will offer much more control. Remember, we said that if you turn a flash head down to half power you are reducing the output of the light by exactly 1 f-stop. Smaller reductions in power with a simple head are obtained by moving the head further away, or closer for more power. Just remember the Inverse Square Law which basically means that if you move your light source twice as far away, you will lose two f-stops of exposure. e.g. Our head is one metre from our subject, using ISO100 film we are getting an exposure of, say f/16. If we move the head back to two metres away our exposure will be f/8, - two f-stops less. For most uses Monoblock, or Compact Flash Heads as they are normally called, will do most of what amateurs and most professionals require. Compacts have all the electronics built into the head (above right), whereas a Power Pack will have a separate floor standing unit with all the electronics in and a separate head, or heads, that are plugged in to this. The head contains a lamp holder for the modelling lamp, the flash tube, simple circuitry and normally a fan to keep it cool. Power Packs are generally used when a huge amount of power is required (up to 6000w/s) and when the units are going to be used at high speed over long periods e.g. for fashion photography. The parts that generate the most heat are housed in the head away from the electronics in the pack, which is also fan cooled. With the new generation Compacts, such as the Elinchrom Style unit above, many of the advantages of the pack have been removed. I am impressed already with the way Chris explains without patronising or assuming you understand technical terms. I already feel I have learned a lot just from part 1. I didn't even understand what the modelling light was for. Thanks Chris.